It’s quite the headline in today’s Telegraph — “NFL could see London expansion team playing at Wembley Stadium ‘by the end of the decade'” — and it immediately spawned lots of other news stories about the possible imminent arrival of American football in the UK. So who actually said what to set this whole thing off? [Wembley managing director Roger] Maslin was confident the ground could stage an entire regular season of eight NFL games. Okay, that’s all well and good — the stadium manager is talking up his stadium’s ability to host stuff, at a time when he’s concerned about corporate buyers not renewing their seat contracts because the stadium isn’t hosting enough stuff to make it worthwhile. But what’s with this “end of the decade” business? One of those conditions would be “tripling” the UK fan base for American football, according to Kirkwood, who said a London franchise was not inevitable. Okay, so what you actually have is the guy in charge of promoting the NFL in Britain saying the NFL could decide come to Britain, if people there would watch more American football. This is not so much “news” as “marketing.” I guess it’s at least nice to see that the States don’t have a monopoly on stenography journalism. This entry was posted in London NFL team by Neil deMause. Bookmark the permalink. What better way to promote the NFL to the British/European audience than to have its absolute worst team play a “home” game there for the next four years? It’s difficult for me to see how most of the corporate crowd who actually “buy” tickets to the superbowl would be able to write off a trip to London for marketing and spending done in the US… but whatever. I guess they’ll have to go, because comparatively few of the 70,000 seats sold for the superbowl are actually bought by average football fans. On the other hand I hope it does happen. The look on the faces of actual British NFL fans when they are told that the same tickets they’ve been comp’d or sold for 1/3rd face value will now cost them 350 quid… for one game… would be priceless to see. Plus I’d love to see 35,000 empty seats at the SB one year Maybe they can borrow the tarps from Lew Wolff since he’s started “not using them” again this post season. I’ve already moved my team to London for this week. They better build me a new stadium back in Minnesota or this move becomes permanent!! What? Oh, my secretary says hey silly, relax, Minnesota already handed me the public trough and told me to slop myself to my heart’s content! Whew, sorry, brain fart there folks. Sometimes I just get into the 100-year-old cognac and lose my head, hehe. It’s amazing the NFL might move a team to London before LA. Well, at least it will come back to haunt them when they get the same amount of paying customers that the Miami Marlins get. London is the territory of the New England Patriots, so Lew Wolf cant move there! 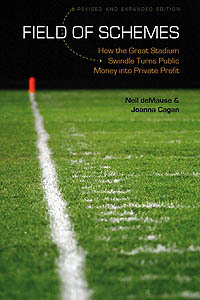 October 2013 Atlantic (monthly) magazine has an interesting article about how the NFL fleeces taxpayers, along with an interesting cover story on how sports ruins America’s high schools. Would the Brits fall for all this, too? I would never say never, but even for top EPL clubs, a contribution toward servicing and infrastructure and some “smoothing over” with planning permission is all they are likely to get. Arsenal will be paying off the mortgage to the new stadium (at Ashburton Grove, now more commonly known as “the Emirates”) for about another decade. As I recall, Arsenal paid for the entire project, with the city paying to move a waste management facility on the site and issuing a compulsory purchase order (eminent domain) for a couple of the remaining properties that make up the parcel. Most top clubs either own their own grounds or pay significant lease fees (Man City and the former “city of Manchester” stadium, now Etihad) to play in them. With regard to those that own their facilities, I do not know how they are treated for tax purposes. I assume there is some sort of tax treaty or “public use” provision, as paying property taxes on a stadium located in either commercial or residential areas at those rates would be ‘crippling’, but I don’t actually know what is done. In short, even if the NFL becomes hugely more popular in the UK than it is, it’s unlikely they’ll receive any public money for a stadium or upgrades. The government that offered same would immediately be descended upon by at least 40 major soccer clubs demanding at least as much (even retroactively) for their projects. I think the Atlantic Monthly article stole info from all the posts Neil has put up, I didn’t get anything new out of it that Neil has not mentioned before. John’s right with regard to the NFL in both his posts…the Super Bowl itself is probably the worst ad for the fans that would buy 80% of the season tickets. My favourite weekend of the year is always conference championship weekend, the SB is basically everything that’s wrong with the game. I really don’t think London is viable. Even with the NFL’s week a game, the travel is killer, no free agents will sign there, any stadium would cost 3x as much as a normal one, and it won’t improve the TV contract that much. The devil’s advocate in me argues the Ruhr or Bavaria would almost be a better bet. From the NFL’s perspective, it won’t threaten like Baltimore, Cleveland, or Phoenix did. This would be absolutely insane, to move the team to London. No one there wants to see the NFL. It’s as crazy as the NBA idea. American sports commissioners are just way too greedy! I think part of the problem is that the NFL has had so much success in America in recent years and gotten so damn lucky so frequently (the recent labor agreement being a major win for the owners; the paying only 750 million in a lawsuit they could have/should have paid billions in; fleecing many cities for stadiums, with Minneapolis being the most recent; etc) that they feel they are invincible, and nothing will stop them. At some point something will go horribly wrong, and it could very well be the London team that’s the huge flop they’ve got coming. We will soon see……. I think you guys are missing the point here: Nobody with the NFL has given any indication that they’re putting a team in London. People in London are saying, “We could be ready to host an NFL team by the end of the decade,” which is decidedly not the same thing. NFL has no intention of putting a team across the pond, whether via expansion or relocation. I don’t think it’s a coincidence that they began hyping up London as soon as stadium efforts fell apart in LA for the twenty-umpteenth time. NFL fans in the UK seem content with the one-off format, and hoping that it’ll be their team that makes the trip to Wembley that year.